So when *does* a SQL Server filtered index get its stats auto-updated? And here's a blog post from Kimberly Tripp discussing the risk of seriously out-of-date stats on filtered indexes. Gail Shaw brings up in the comments a case with a million row table and a 10000 row filtered index that required over 200000 modifications to the filtered index before updating. As I've been researching an issue with long query compiles when filtered indexes are involved, I've come up with more questions than answers about the handling of filtered index statistics. For example, here's an interesting change from 'Stationary' to 'Unknown' for the leading column on a filtered index. But lets talk a little about auto-update of filtered index stats. In the tests I walk through below auto create stats and auto update stats are both enabled. Auto update stats async is disabled. Default stats auto-update threshold calculation (pre-SQL Server 2016) is widely known. When statistics for a table of more than 500 rows are updated, the next auto-update threshold is set: except for filtered indexes/stats, its 500 + 20% of the rows in the table at that time. When the threshold is reached, the stats are invalidated. The next time the query optimizer asks to load those statistics, if auto-update statistics (without async) is enabled, the stats will be auto-updated before the query optimizer continues with its merry work. If async is enabled, although the query optimizer won't wait for the update, the stats auto-update is queued. Wrinkle number 1 is trace flag 2371 before SQL Server 2016 - or the default threshold calculation as of SQL Server 2016. For tables below 25,000 rows, update thresholds are the same as ever. Above 25,000 rows the threshold is calculated as sqrt(1000 * table rows). This allows very large tables to qualify for auto-update much more often than the previous default calculation. Filtered indexes are another significant wrinkle. Please bear with me as I introduce the tools I've been using for testing. This is a stored procedure to drop (if it prexists) and create the test table. I create the filtered index in question separately because I've been fiddling with a number of different indexes. Here's the relevant index for today's post. Note [Bit__1]=(1) in the filtered index predicate. Someday in the future it'll be really important that Bit__1 is in the predicate without being in the keys or include list. But I've got to work up to that :-) [Bit__1]=(1) is also important when looking at the stored procedure that I use to populate the table. Its got 10 rows out of every 100 with [Bit__1]=(1). Now that the table and filtered index are in place, let's have a stored procedure to populate some data. This one handles 100 rows at a time for me. As I mentioned before 10 rows out of 100 have [Bit__1]=(1). I used that ratio just to make tracking the numbers a bit easier. For this testing, the query itself is quite important. I wasted hours of testing with queries whose plans included the filtered index after loading only the stats header and NOT loading the stats. Turns out that happens pretty frequently when filtered indexes are involved - and it will NOT trigger an auto-update of the filtered index stats even if the threshold is passed. Hopefully I'll blog about that sometime in the future, too. Here's a query I've been using in my testing once I confirmed that it loads the filtered index stats and triggers an auto-stats update as expected. I wrapped it in a stored procedure to make my test scenarios easier to manipulate. Here's a final stored procedure. This proc I use to display some stats update history using trace flag 2388. So let's create the table and filtered index, and populate it with 5100 table rows. 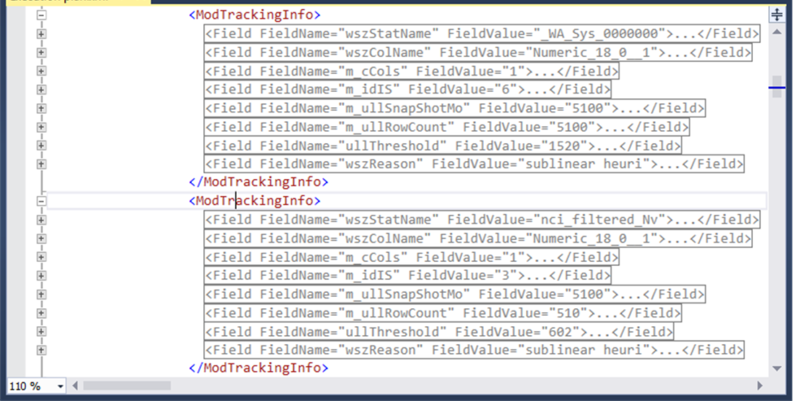 Stats won't get their initial update until the query optimizer loads them while working with a query. So let's make sure that happens. I'm enabling trace flag 8666 at the session level here so that stats info is included in the 'actual plan' when I retrieve it. That looks as expected - three auto created stats and the filtered index stats all with their first update in response to the test query. Let's take a look at the plan xml from T4139_testQuery. The threshold for the column stats is 1520. That's (20% of 5100) + 500. The threshold for the filtered stat is displayed as 602. That's (20% of 510) + 500. Let's add 1520 table rows - the threshold for the column stats. Since we've added 1520 rows to the table, will the test query lead to an auto stats update? /* Auto-update for filtered index stats yet? Nope. Each of the auto-created column stats relevant to the query have now auto-updated. That makes sense, because 1520 table rows were added and 1520 was the threshold for the column stats. The filtered index has changed in a more limited manner - it increased from 510 rows to 680 rows - a net gain of 170 rows. But the threshold of 602 appeared in the plan XML. Let's add more rows - but use [Bit__1]=(1) in all of the new rows - making them all qualify for the filtered index. So we've added 4499 rows to the table and the filtered index. That's a lot more than the 602 specified as the threshold. Think the filtered index stats have been updated yet? Well... let's add just one more row. Whew! Finally! The filtered index stats finally updated after 4670 inserts into the filtered index. That's a lot more than the 602 prescribed by 20% + 500 - which also appeared in the trace flag 8666 information in the actual plan XML. I was hoping to uncover a pattern to make filtered index stats auto-update more predictable. But I'm not close to finding the pattern yet. At this point, its not close to as predictable as auto-update of column stats. But, when prioritizing stats for manual update, it looks to me like filtered index stats should be high on the list compared to column stats which may more easily benefit from auto updates. I mention Michael J Swart's Connect item below. What I didn't notice earlier was the 'Details' link in the Connect item - behind which was his code for reproducing the issue. Also there in his details is the *big clue* . When a quickstats query is issued for filtered index stats... it has no filter! That forces a full table scan unless a nonfiltered index with the same first column happens to be around to help that quickstats query out. Today we learned that in SQL Server 2016 sp1 filtered indexes are exempted from quickstats queries. I put some code in Connect item 2528743 comments that can be used to explore the behavior. Still working to recreate the "obnoxiously long plan compile" in a lab. A problem I first blogged about here. I remembered exchanging tweets with Michael J Swart (@MJSwart) about something similar earlier this year. Here is the Connect item he filed. I made some interesting observations here. SQL Server trace flag 2388 shows negative numbers of deletes/inserts for a filtered index since previous update? And I started to formulate a suspected model for what was going wrong here. One of the remaining pieces of work is to show that there is a problem with the quickstats update. I now think that one or all of the Connect items listed below are involved. So the theory is that with trace flag 4139 and/or 2390 enabled, and a filtered index branded "unknown", a quickstats update is triggered. And the quickstats update ends up using a horrible, horrible plan because of an issue like those detailed in the three Connect items below. If the optimizer happens to load such a filtered stat multiple times, the quickstat update is performed multiple times - amplifying the time added to the query compile. Aha! Miloš Radivojević (@MilosSQL) to the rescue! In this blog post, Miloš uses an extended event session with event sp_statement_completed added to retrieve the statement for the quickstats update. When the optimizer handles the stats for his nonclustered index without a filter, the SQL statement retrieved is of the following form. But what if the index is filtered? I think that the "surprise" of index stats lead column from one brand to another is in part due to sampled updates rather than FULLSCAN updates. When I get a chance to revisit testing, I'll be comparing FULLSCAN to sampled updates, with out-of-range inserts and when the underlying data is unchanged. Here's some background on trace flags 2389 & 2390 and how they address the 'ascending key' problem. Note that trace flags 2389 & 2390 only influence the optimizer for indexed columns. Should be a seek to get to the maximum value, rather than the full table scan needed to ensure max value for a non-indexed column is known. But way back when there was a compile time issue with trace flags 2389 & 2390. "This problem occurs because SQL Server performs a scan of the appropriate column. This scan takes extra compile time." I've been chasing down an issue for a few weeks where query compile time for some queries has unexpectedly ballooned to several minutes. Now I'm circling around diagnosis and remedy. Let's look at trace flag 2388 show_statistics information as a nonclustered index grows - first without a filter, then with a filter. So 12 rows were inserted - and after each 3 inserts, stats were updated. End result was the leading index key (in this case the only key) was branded 'stationary'. Stands to reason, since the key value kept decreasing as the WHILE loop iterated and INSERT commands continued. But what happens if we do one more UPDATE STATS without changing the data in the table? Huh. The brand switched from stationary to 'unknown'. Lets perform the same type test with a filtered index. Cool. Also ended up with a 'stationary' key. Let's do one more stats update, as we did for the index without a filter. Look at that! Oh... wait a minute. Still stationary. Let me try that again. Aha! That's what I wanted to show*. Yes - a filtered index that is branded as 'stationary' can be rebranded as 'unknown' if stats are updated when no changes to the underlying table have been made. That's not too surprising since that's what happened for the nonclustered index without a filter above. But the optimizer engaging its trace flag 2390 quickstats behavior for an 'unknown' leading index column might be a surprise here. Combine that with a problem in quickstats behavior for filtered indexes of large tables and query compiles can start to take minutes. (The longest I've seen so far has been about 34 minutes on a table of roughly 600 million rows). But the actual work of showing evidence of a problem with quickstats for filtered indexes on large tables will have to wait for another day. *I don't know why it took 2 updates with no data changes (after the 4 updates with changed data) for the filtered index key to change from 'stationary' to 'unknown'. I've got to leave that question for someone more knowledgeable than myself.